So, why the error? First, notice that the link points to a folder name, and not a page: http://somewhere/Shared%20Documents/Folder. After clicking on the link, I was taken to http://somewhere/Shared%20Documents/Folder/Default.aspx, instead of the default view for the folder “Folder”. It turns out there was a file named “Default.aspx” in the folder of the library. 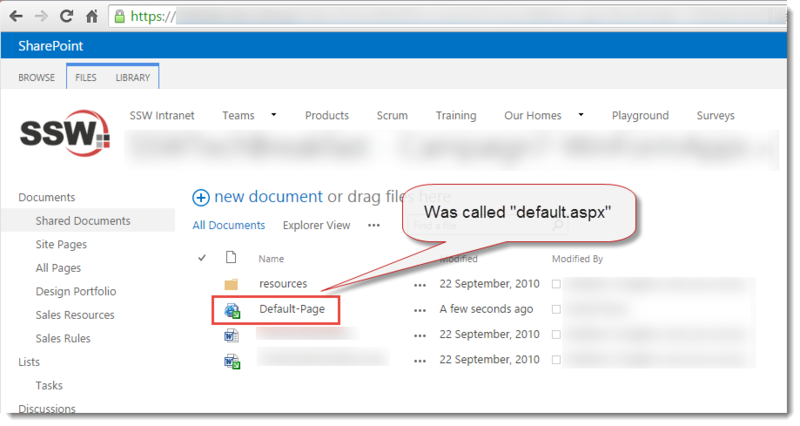 Because of its file name, SharePoint automatically redirected to this file instead of displaying the default view for that folder. The correct URL is nasty, but as you can see it specifies the default view “AllItems.aspx”, as well as the folder to display with the RootFolder parameter. As for the “something went wrong” error, that was simply due to the contents of the “Default.aspx” file. It contained some invalid code, so the underlying exception (which I retrieved from the ULS logs) was System.Web.HttpException: Code blocks are not allowed in this file. In this case, the Default.aspx file wasn’t important anyway.